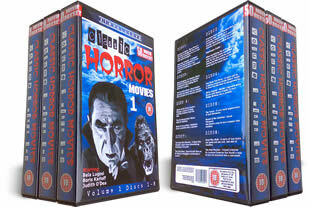 Classic Horror DVD Boxset, 50 films on 24 DVD's in 3 large cases, in stock and delivered FREE in the UK. 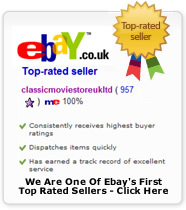 Buy a complete collection of classic horror films. 50 Classic horror movies on this 24 dvd set. Titles Include: Black Dragons, The Invisible Ghost, Atomic Age Vampire, Nightmare Castle, Creature from the Haunted Sea, Carnival of Souls, Giant Gila Monster, Fatal Hour, The Gorilla, Planet of the Apes, Tormented, Nosferatu, Night of the Living Dead, King of the Zombies, Mr Jeckle and Dr Hyde, The Killer Shrews, The Brain, The Phantom of the Opera, The Indestructible Man, The Hunchback of Notre Dame, Swamp Women, The Little Shop of Horrors, Tormented, The Monster Walks, Monster from a Prehistoric Planet, Bloodlust, The Amazing Mr. X, Last Woman on Earth, The Bat starring Vincent Price, The House on Haunted Hill, The Last Man on Earth, Dementia 13, One Body Too Many starring Bela Lugosi, White Zombie, Attack of the Giant Leeches, The Screaming Skull, Beast of Yucca Flats, The Terror, The Fatal Hour, Dead Men Walk, The Mad Monster, Maniac, Metropolis, plus many more films. No quiblle money back guarantee.